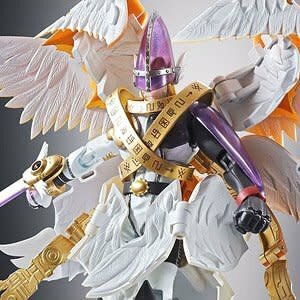 Digivolving Spirits 07 Holy Angemon (Completed) by Bandai Hobby. 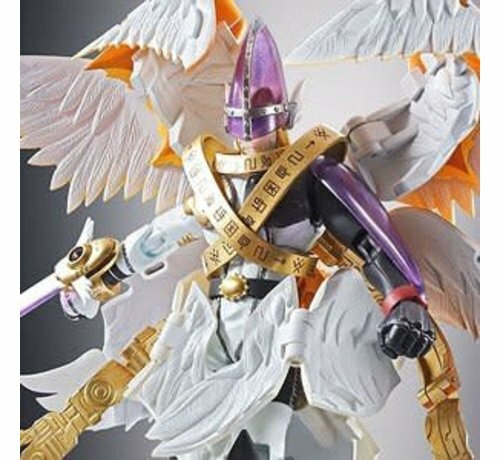 [Super evolution soul] The seventh bullet, [Holy angemon]! - Pursuing the purity of Patamon before evolution which is the charm of Digimon and [Shintiness] of evolved Holy Egemon to the limit. Ultimate collector's item that encompasses the surprise and enjoyment as a perfect deformation figure without replacement appeared. Following the nostalgia of evolution from [Patamon] which was released in the past super evolution series in the seventh bulletin, the form after evolution is the evolutionary form of the time [Ejememon] upper evolution form New design and design is carried out with the complete body [Holy Angiemon]. It is possible to enjoy the pose which imaged the time of flight by the movement of 8 beautiful feathers. Completion of the ultimate modified figure that you can enjoy the proportion of dynamic and divine [Holy Angiemon] you can not imagine from a cute whole [Patamon]! 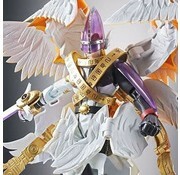 The super evolution spirit series condenses insistence on details of the modeling! Regarding the beautiful character design of Horie Enjemon, even small molds of feathers are expressed. Also reproduce hidden parts thoroughly! Engraved emblem of the forehead on the head part, upgrade perfection by faithfully reproducing the setting! The super evolution soul series can also enjoy the texture when taken in hand. In addition to the entire chest parts, waist belt, also use die-cast parts for toes and right arm sword. The clear parts are used for the head, shoulder and sword, expressing a beautiful silhouette. - In addition, this time also use the illustration of Mr. Kenji Watanabe's new drawing up!